Door Hangers Printing... shipped free within the contiguous U.S.
We offer design for Door Hangers at a low flat-rate cost! This includes your first draft design plus up to 4 revisions for 5 total versions - usually this is more than enough 95% of the time. Extra rounds of revisions will cost $10 each. Door hangers are much more effective than typical flyer or postcard ad mail. This is because it's placed directly on the door and doesn't get mixed in with the junk mail, which guarantees the home owner will at least look at your offer briefly. This can be made even more effective with a perforation. We can add a perforation to our 3.5x11 and 4.25x11 Door Hangers (UV Gloss hangers only). The perforation is done 2" from the bottom so when torn off it's either 3.5" x 2" (size of a business card) or a slightly larger 4.25" x 2". Most people use the perforation for either a business card or a coupon to encourage their potential customer to hold on to it. Most people won't hold on to a full door hanger but are much more likely to hold on to a business card or coupon. What's the difference between 14 pt and 16 pt? Really very little. Pt is an abbreviation for point. A point is a measurement of thickness in printing. 16 pt is very thick; generally door hangers are printed as thin as 9 or 10 while some of the thicker are only 12 or 14 pt. You'll rarely see a door hanger thicker than 16 pt or even 14 pt, so you can be confident it's a nice thick stock. If you're familiar with cover stock weights, 14 point is equivalent to about 114 lb cover stock and 16 point is a bit thicker than 120 lb cover stock. The most common size is 3.5x8.5, though this is mostly because it's the most inexpensive option. If you want a perforation, the 3.5x11 is a great option if you want the tear off to be exactly the size of a business card, though many prefer the wider 4.25x11 as well. In short, there is no 'standard' for door hangers, and you should order whichever size fits your budget and works best for your marketing. For UV Gloss (high gloss) coatings you'll see we offer 'UV Gloss on Front Only' as well as just 'UV Gloss'. Products with UV Gloss have gloss on all printed sides by default, but if you'd like it on one side only of a 2 sided hanger, you can select the 'UV Gloss on Front Only' option. This option is available because UV Gloss cannot be written on with a pen, and leaving one side without the UV Gloss will allow you to write on one side. The other side still has a very slight gloss. What is the Uncoated Stock? Matte Coating is often confused with Uncoated but they are actually quite different. The Matte Coating is a nicer product and has more of a Satin finish. It can be written on with a pen easily. The Uncoated option is recommended if you need to print on the hangers with an inkjet printer after ordering. The lack of coating allows the ink to be absorbed. The uncoated is also good if you're looking for a very natural look. Can You Distribute My Door Hangers? 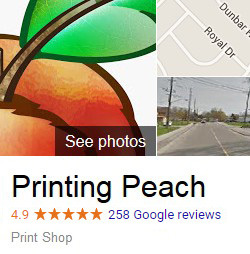 Currently we do not offer distribution through Printing Peach. There are many flyer distribution companies and most will also distribute Door Hangers.